With a 50K just around the corner (I can’t believe December is a little more than a month away), I’ve been trying to run at least a half marathon on the road or trail every weekend. With a distance running goal rather than a time in mind, I’ve diversified my training regimen, with plenty of spin, swim, and weightlifting filling my schedule. On November 15, Jesse and I are running the Mt. Tam Trail Run as a training run for North Face. I’ll be tackling the 30K while Jesse is racing the 50K in preparation for 50 miles at North Face. 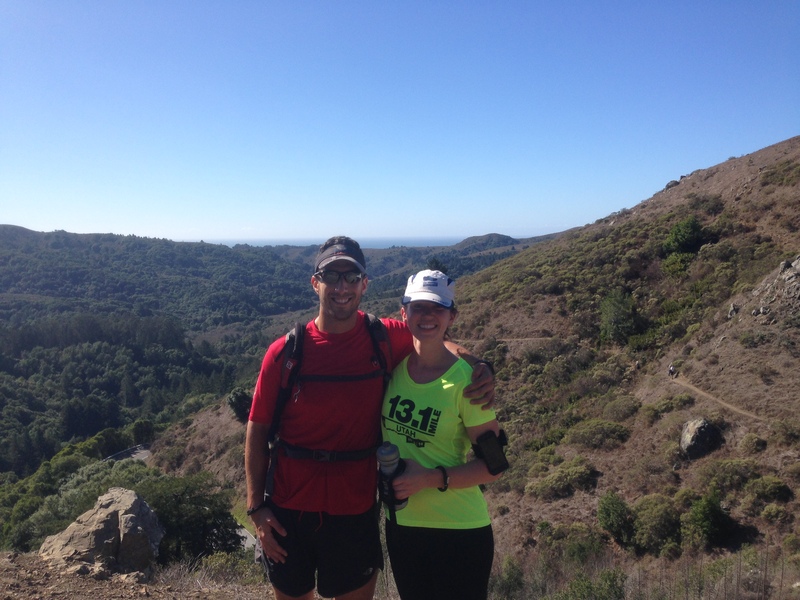 On Sunday, Jesse and I joined his colleague Kevin (who recently moved to Mill Valley) for a seven-mile trail run. We ran familiar trails (Dipsea, Sun, Lost, back to the Dipsea), and Jesse totaled nearly 40 miles over four days. While Jesse can handle high volume, I know I should not mimic his training. Jesse recovers like a champion, while I can feel the effects of DOMS for up to four days after a weightlifting workout (which happened last week). Sleep, stretching, and regular massages are they keys to my athletic recovery. I’m looking forward to Daylight Savings Time ending this weekend – running in the pitch black before work has been little disheartening. I’ve never done a 50K. How exciting! And I’m with you on the cross-training. I find I can run longer if I vary things up. Good luck to you! Same with me. And thank you! It is exciting. Great course. I’m looking forward to the time change too! It’s strange to be done with coffee and breakfast when it’s still dark out. I’m so impressed you are running a 50K!! I know it is different than road racing, but I still have a hard time wrapping my head around it! Thank you! It is a totally different animal. Good luck with your 50K! It’s true that everyone has to train differently and it’s great that you are doing what works for you! Ugh, me too! I hate leaving work and it’s pitch black. It’s so depressing! You guys are so inspiring. Your training sounds great and I can’t wait to hear how everything goes for you coming up! I’m right there with you on the early morning dark runs too. It’s tough to go out and come home in the pitch black. This weekend will definitely be a welcome change! Yes! Let there be light! Daylight savings can’t come soon enough! !